French PM François Fillon met the French Community last night after addressing the City of London and meeting with British PM David Cameron and Deputy Prime Minister Nick Clegg to ask for closer cooperation within the Eurozone. Mr Fillon pointed out that the 17 Eurozone countries must increase the coordination of their economic and social policies - despite worries over a deepening debt crisis within the bloc. He also urged Britain, which is not currently a member of the euro and is not considering joining under the current administration, to support the push for cooperation. He told journalists: "The euro does not need to be saved, the euro needs to be defended" and also said that "What we need is to strengthen our cooperation. The Eurozone governments need to put in place a strategy which enables us to harmonize our fiscal policy and how we organize our economies." 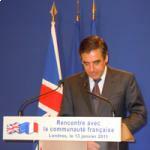 Addressing the French community members who had been invited to meet him at the Residence de France, François Fillon stressed the need for Europe to fight as one to ensure that in the years to come, Europe will still remain strong. He also mentioned the growing economic threat of the Asian countries and the fact that China was on course to overtake the US economy. Amongst those assembled to meet him were the heads of French companies in London, heads of the various French community associations and some of the few remaining men who had joined the Free French in 1940. François Fillon expressed his emotion at being in the presence of the men who had joined General de Gaulle and praised them for saving their country’s honour. He went on by saying that the French in London represented a driving force in the economy and were better placed than most to understand the economic stakes. Mr Fillon was also in London to reassure the electorate that the present government was not simply going to go into pre-election mode given that there was no time to waste on the urgent issues to be addressed. Are the French in London worth more than the French at home? Some of the government’s biggest financial backers during the last election were certainly London- based. Hence the importance attached by French politicians to high-profile visits to London. Mr Fillon , and others, will be back as the next election looms , and not just to talk about the state of the economy. Please note that Jean-François Copé, who was François Sarkozy’s unofficial spokes man during the last presidential election and now Secrétaire Général of the UMP and Maire of Meaux comes to London on 19th February.